Matt Moore (pictured) has been named the new Sports Information Director (SID) at Grace College, Winona Lake, Indiana, according to Grace’s Athletic Director, Chad Briscoe. Moore currently serves as an assistant basketball coach at Grace College and officially began his SID duties effective January 2, 2008. Moore was a four-year starter for the Lancers men’s basketball program from 1998-2002 and finished his career with 660 assists (4th overall). Upon graduation, Moore began his coaching career as a graduate assistant in 2002-03 at Grace, with his assistance the program finished 24-11 and the NCCAA National Runner Up. After one year at Grace he moved to Logansport High School where he taught and served as assistant boy’s basketball coach for three years under legendary coach Al Rhodes. He also received the distinct honor of serving as an assistant coach for the McDonalds All-American game in 2005. 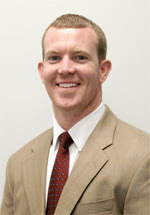 Moore returned to Grace College as an assistant basketball coach in 2006 while teaching at Columbia City (IN) High School. Matt and his wife Anna were married last July 7, and reside in Winona Lake.